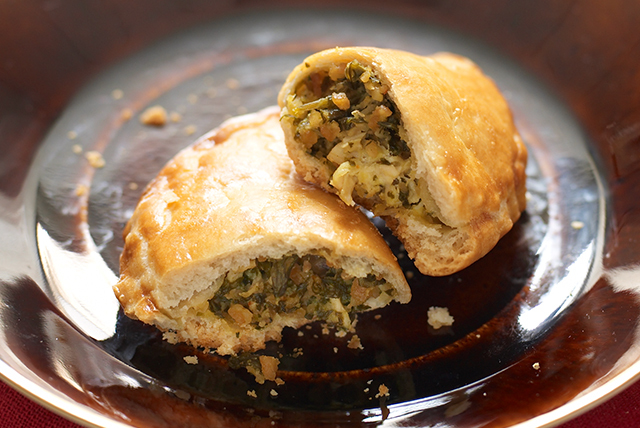 Bake up this Cilantro and Chicken Empanadas Recipe and impress your guests! This easy chicken empanadas recipe features toasted almonds, grated Parmesan, fresh cilantro and parsley. Prepare Empanada Dough as directed; set aside. Process next 5 ingredients in food processor until mixture forms thick paste. Stir in chicken. Heat oven to 400°F. Shape dough into 24 balls, using about 1 Tbsp. for each. Flatten each to 4-inch round. Spoon about 1 heaping Tbsp. chicken mixture onto center of each round. Brush edges evenly with half the egg; fold in half. Seal edges with fork; place on parchment-covered baking sheet. Brush with remaining egg. Assemble empanadas as directed; place on parchment-covered baking sheet. Refrigerate up to 24 hours, then bake as directed. To freeze, layer unbaked empanadas between sheets of waxed or parchment paper in airtight container. Freeze up to 2 weeks. Thaw completely in refrigerator before baking as directed. Set aside family time to connect and enjoy good food and good company while being mindful of portions. Impress your guest by shaping empanadas differently. Or place a stencil over unbaked empanadas, brush beaten egg around stencil, then remove stencil and bake as directed. Toasting nuts adds crunch and intensifies their flavor. To toast in the oven, spread nuts onto bottom of shallow pan. Bake in 350°F oven 10 to 15 min. or until nuts are golden brown, stirring occasionally. Or to toast on the stovetop, place nuts in skillet; cook on medium heat until golden brown, stirring frequently.